I’ve wanted to visit this outstanding and seldom-seen pictograph panel for a while, and at the end of last month I was finally able to make it happen. 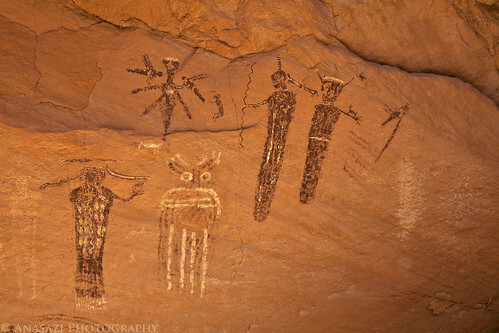 This Barrier Canyon Style panel is not very big, but there are many unique figures found here, including the dragonflies that this panel is known for. The figures may be small, but they are also very detailed. Besides the dragonflies found in this scene, there is also an elongated dog-like figure and a small rabbit-like zoomorph next to the larger anthropomorphs. When I first arrived at this panel, I was disappointed to find it half in the shade and half in the sun, which wouldn’t work well for photography. I stuck around for a while and examined the panel closely as the sun moved across the sky until the panel was fully in the shade. I spent an awesome day hiking to this panel and a few others nearby in a pretty remote area…it was great! Click on the image above to view it larger on Flicker so you can see all the exquisite details.